At St. Andrew's-Sewanee School we enjoy a rich Anglican heritage. Our historic understanding of faith encourages openness and respect for other religious traditions while the school community remains grounded in the history, tradition, and liturgy of the Episcopal Church. Students are encouraged to find their own process to a faith that will provide them with a deeper understanding of life and service. Students represent a wide range of faith traditions. 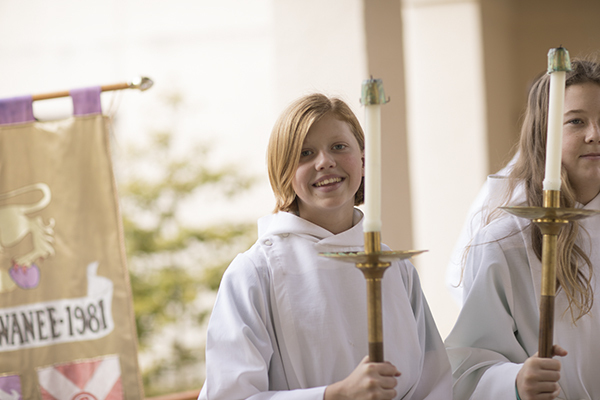 Forty percent of our students are Episcopalian. The overall school community is characterized by openness, trust and forgiveness. The School Chaplain, an Episcopal priest, is a full time employee of the school and serves as pastor to the school community. The school also employs a parttime assistant chaplian. Students and faculty attend regular chapel services in the 100-year-old St. Andrew's Chapel. An all-school Eucharist is celebrated on Monday morning as a means of gathering and focusing the entire community at the beginning of each week. Music is an important part of our worship. Boarding students also attend a Compline service on Sunday evenings. As we are able, we will also provide transportation for students to additional worship services in the Episcopal church and/or other faith traditions. All seniors take a one year course focusing on the religions in the Abrahamic traditions. The course culminates in each student writing a Creedal Statement addressing the student's ultimate concerns and beliefs. Senior Chapel Talks are opportunities for members of the senior class to offer the gift of wisdom, truth, and encouragement to fellow students, faculty, and staff. Family, friends, and community members are encouraged to attend. With the help of our Chaplain, students may prepare for baptism or confirmation in the Episcopal Church. Find out more about Sewanee, an Episcopal Center of Learning. The Rev. Molly Short assumed the role of Chaplain in 2018. Mother Short joined the SAS community in 2014 as a residential house parent. She became assistant chaplain the following year. In addition to her role as Chaplain, Mother Short teaches Introduction to Religious Studies. She was formerly Lead House Parent in Warner House, House Program Leader for Gorgas, and served as SAS's liaison to regional Episcopal churches. Mother Short holds a D.A.S. from the School of Theology of the University of the South, an M.Div. from Duke Divinity School, and a B.S. in Earth and Environmental Sciences from Furman University. My role as chaplain is to walk alongside the members of this community in both the best and hardest moments of life together. Enjoy sermons by Mother Short on our Campus Voices page.